It’s do or die for the Blackhawks tonight as they go into Game 6 with the Coyotes leading the series 3-2. Coach Quenneville and his Hawks are coming back to Chicago. After Saturday’s dramatic overtime win (as every game in the series has gone to overtime), the Hawks absolutely have the momentum, especially coming to play in front of their fans at the United Center. The Yotes took both games at the UC earlier in the series (games 3 and 4) and this time the Hawks need to capitalize on their home ice. 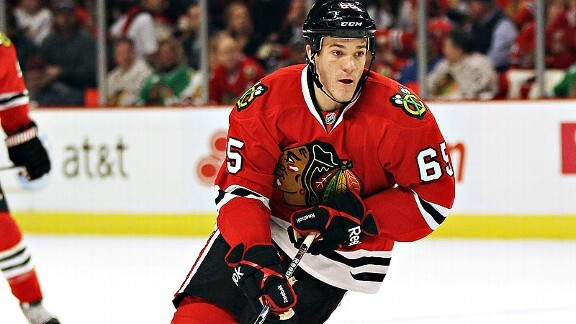 Andrew Shaw returns to the team tonight after serving his three-game suspension for hitting Phoenix goaltender Mike Smith. We’re hoping he gives the Hawks an additional boost of energy. On a negative note, the Blackhawks will be without Marian Hossa, who is still recovering from his nasty hit from Raffi Torres (did I mention that punk was suspended for 25 games). Quenneville said there hasn’t been a change in Hossa’s status since the hit in game 3. Here’s what the Hawks need to do tonight: they need to score quick and early. The Coyotes are NOT a better team offensively, and they’re basically just playing “keep away” with the Blackhawks. If the Hawks can find their intensity early on, the Coyotes don’t stand a chance. Kaner – I’m looking to you to get in there and score some goals – you too Sharpie. The Blackhawks have avoided elimination once. We can win tonight and force the series to go to game 7! Raffi Torres, a Coyote player who’s name wouldn’t sit well with any Blackhawks’ fan at the moment, has been suspended indefinitely for his dirty hit on our beloved Marian Hossa. 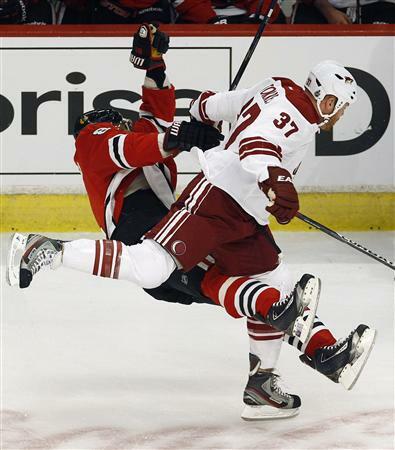 During the first period of game three of the Coyotes-Blackhawks series, Torres left his feet and slammed his shoulder into Hossa’s head, who did not have the puck at the time. Totally illegal. Hossa laid motionless on the ice for what seemed like forever (it was about 5 minutes) and was then carted away on a stretcher. He was taken to the hospital, but reports state that he left on his own two feet after undergoing some tests. The best part, “none of the officials saw the hit” – there was an official standing RIGHT THERE. Because this massive hit went unnoticed, Torres did not receive any sort of penalty during the game. Second, Torres is a dirty rat and I hope he’s suspended for the rest of the season. I know hockey is a rough sport and there are obvious risks you run playing a dangerous sport. Don’t get me wrong I love the fighting, but a hit to a player’s head is unnecessary. Torres has an in-person hearing scheduled for Friday with the NHL. Because the hearing is in-person means he could face a six game suspension or more. After game 3, Torres told the Arizona Republic that as far as the hit goes, he felt it was a “hockey play”. 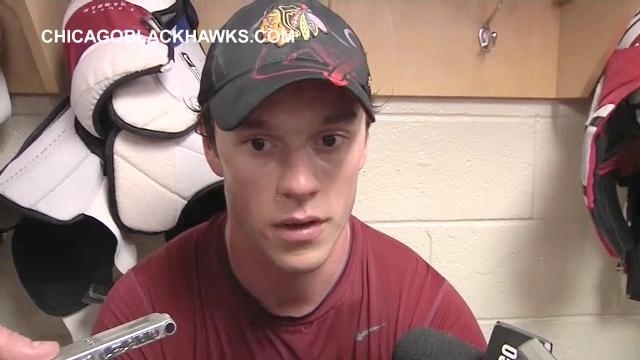 Blackhawks’ Captain Jonathan Toews didn’t like that much, “Well, that’s obviously the way he thinks,” he said. “I said it before, it’s the same when he was with Vancouver last year. There’s no remorse at all with a guy like that. You pretty much take him out and have a guy carried on a stretcher and he probably doesn’t feel bad about it at all. 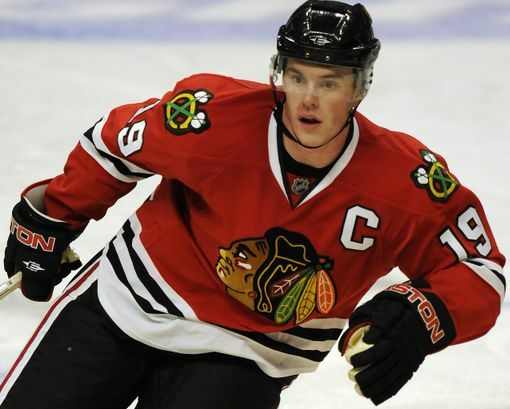 That’s not hockey to me.” That’s why we love you Toews. The Coyote forward doesn’t have the cleanest track record either. Last April, it was a hit on Brent Seabrook from Torres during the Vancouver- Chicago first round series. He was not suspended for this hit, but had been previously in the 2011 season. Like I said, once a Canuck, always a Canuck. It seems like this year’s run to the Stanley Cup has been violent all over the league. I’m a little worried what will happen in the next rounds when things heat up even more! The Chicago Blackhawks will be heading to the desert to play their first-round of this year’s NHL playoffs against the Phoenix Coyotes. Because the Coyotes won the Pacific Division (even though the Hawks had WAY more points, more regulation and overtime wins) they get home ice advantage. The Phoenix-Chicago matchup is missing the “story-lines” of recent first round opponents, there isn’t animosity that oozes from every Vancouver game, they don’t have one of Chicago’s past goalies tearing it up in the net like San Jose, and there isn’t any deep rooted historic rivalry that lives with the Detroit Red Wings. Perhaps the Blackhawks and Coyotes can create their owns subplot this series – everyone loves a juicy rivalry. With Blackhawks’ Captain Jonathan Toews status still questionable, and after sitting so many games he will be a little rusty on the ice, Chicago will be looking to another star, Patrick Kane, to keep up his play. He has truly stepped up his game at the end of the regular season with the loss of Toews. Kane may not have a “C” on his jersey, but that boy can score. Phoenix will host Games 1 and 2 Thursday and Saturday. Unfortunately, the Pacific Time zone is not in Chicago’s favor as both games have 9 p.m. central time starts (damn west coast). The Blackhawks will host Games 3 and 4 at the United Center on April 17 and April 19. Game 3 is slated for an 8 p.m. start and Game 4 for 7 p.m. Game 5 will head back in Glendale on April 21. Game 6, if necessary, is April 23 in Chicago; Game 7, if necessary, is April 25 in Glendale. Get your Blackhawks gear ready, it’s Stanley Cup playoff time! After much consideration, Blackhawks Captain Jonathan Toews will not be playing in the season finale against the Detroit Red Wings. He said he just doesn’t feel right on the ice, and he’s hoping to be back active for game one of this year’s playoffs. I think he needs a puppy or something to cheer him up. The Red Wings are never an easy game for Chicago as they are a long time rival, but today they will take the ice with authority after their loss Thursday night against the New Jersey Devils left a sour taste in their mouths. Hopefully Kaner will be swift with his stick today and let that bad taste resonate in their mouths a little longer. After tonight’s game the Blackhawks’ playoff positioning will finally be secured and they will know their first post season opponent. Honestly, it doesn’t matter WHO they are playing it’s always about HOW they are playing. Because when the Hawks are on, they can beat anybody. 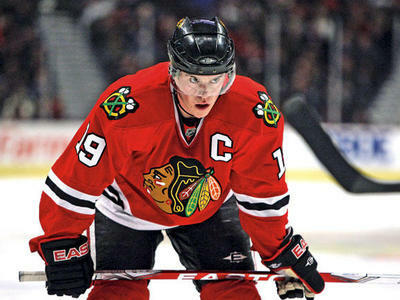 I am really starting to miss Jonathan Toews and his handsome face. Word had spread that he could potentially play in Thursday’s game against the Minnesota Wild after the Blackhawks captain was cleared for contact, but that hope was shot down today. When asked why Toews is still out after being fully involved in practice this week Coach Joel Quenneville said, “it’s all part of the process.” He will miss his 21st consecutive game and last played Feb. 19 against the St. Louis Blues. 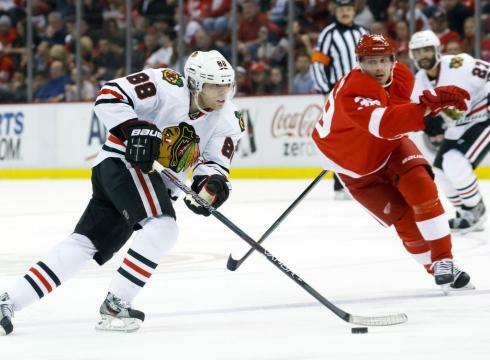 We could still potentially see Toews on the ice against the Detroit Red Wings this weekend. Do not fret, there is still one positive to Thursday’s game. Duncan Keith is a free man now, his five-game NHL suspension is over. It was essentially more of a refresher course than anything, he recharged his legs, regained even more strength. Welcome back #2! Promise not to panic, but Derrick Rose was involved in a minor car accident today. The Bulls say Rose was not injured. Yes, I know what you’re all thinking, another Chicago sports superstar caught up in a fender-bender — Blackhawks Captain Jonathan Toews accident was just a few weeks ago. What is going on? Illinois State Police say Rose was headed south on the Kennedy Expressway at Ogden Avenue late Tuesday afternoon when his 2011 Bentley was rear-ended by a 2002 Saturn. Police cited the driver of the Saturn, Charles Tratwein, for failing to reduce speed to avoid a crash. Well first things first, the Kennedy or otherwise known as 90, is a death trap. People commuting eat their breakfast, do their makeup, read newspapers, host conference calls, and type emails all while driving, it’s just plain dangerous. As if having someone crash into your Bentley wasn’t bad enough, the accident occurred on the same day Rose was fined $25,000 by the NBA for criticizing the officiating. 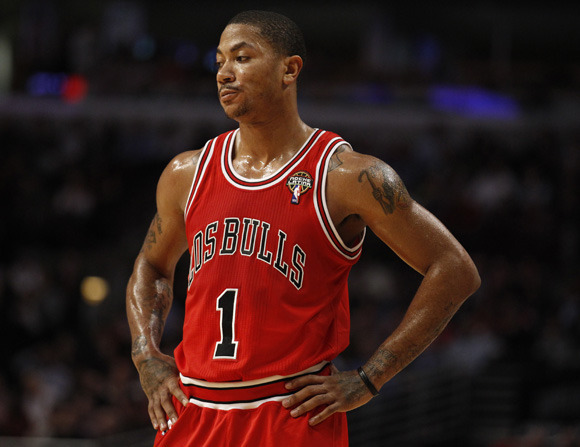 Rose mouthed off after a 104-99 win over the New York Knicks on Monday. Tomorrow is a new day, beat the Heat! When I heard Blackhawks Captain Jonathan Toews was involved in a car crash this morning, I have to admit my heart plummeted a bit. He’s so young, a great leader, one hell of a hockey player, and not to mention easy on the eyes. LUCKILY, Toews was not injured when his car (a Mercedes Benz obviously) struck a support beam of the CTA tracks on his way to their morning skate. A source on the Blackhawks’ public relations team confirmed Toews was not injured in his minor one-car collision in downtown Chicago this morning while driving himself to the United Center. I’m very curious what the cause of this accident was. Could the “upper body injury” – better known as a concussion – be the reason behind his random car accident? The injury is thought to have occurred during the 9 game road trip, Toews most likely suffered the concussion in the San Jose game on February 10. Also, reports stated people on the street were trying to get autographs from Toews. He just got in a car accident, leave the boy alone! According to ABC Quenneville said the team is still unsure whether Toews will travel with the team Friday to California for back-to-back games against the Los Angeles Kings and Anaheim Ducks this weekend.